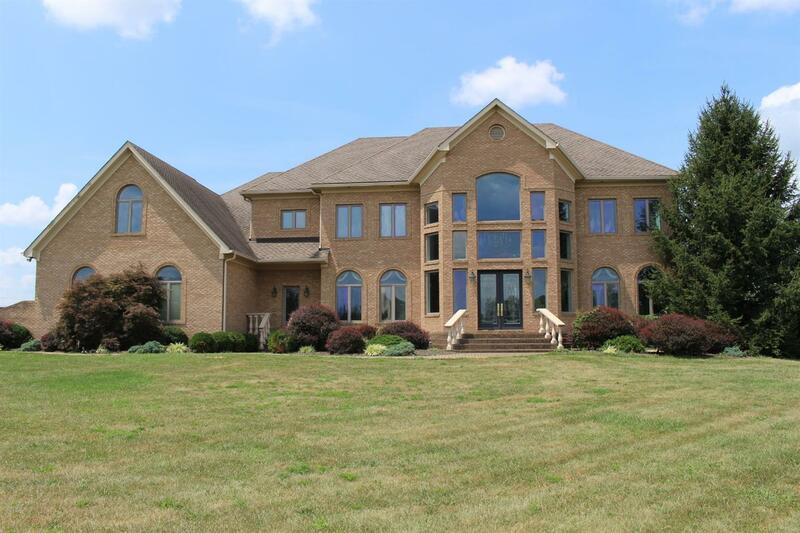 Luxurious, custom built, all brick home! Extravagant and stunning both inside & out. It will take your breath away when you walk in the entrance and see the twin staircases which were built on site. Enormous windows in the front cover almost 200sqft of glass. Marble, tile and hardwood floor all on 1st floor. The balconied hall overlooks a sunken great room w/17' built in entertainment center w/a 24'tall stone chimney fireplace. Wide-open gorgeous, gourmet kitchen w/granite counters, huge pantry, and a 23'window seat to enjoy watching your horses in the field. Guest bedroom w/separate entrance on 1st floor. Master suite has see thru fireplace, sitting area, balcony, dressing room, massive closet, exercise room, and a sprawling bath. Each bedroom has their own bath. Laundry rm on 1st flr w/cloths shoot, built-in ironing board, & separate entrance. Unfinished basement w/full bath & gas fireplace. Barn, riding arena, 6 acres of pasture. Minutes from interstate, Horse Park.